The Lange Voorhout Palace houses the largest collection with works from the hands of the tessellation and optical illusions master: Dutch graphic artist M.C. Escher. Maurits Cornelis Escher, who lived from 1898 to 1972, was a genius at drawing impossible situations. If you take a closer look at his work you realise that Escher’s illustrations are mathematical masterpieces of optical illusion. In one of his most famous works, Waterfall, water flows uphill and the towers are put together incongruously. Other works show birds morphing into fish and figures that endlessly walk up and down a staircase in the same courtyard. 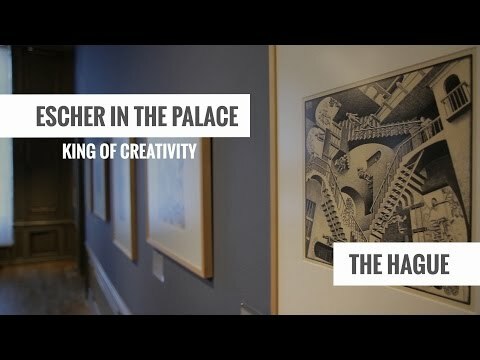 The exhibition at Escher in the Palace combines unique works of art with biographical material including photographs, letters, and preliminary sketches. Escher mainly worked with printing techniques such as woodcut, lithography, mezzotint and tessellation. On the second floor, the question 'What is an optical illusion?' is presented. Here visitors can discover the 'Escher experience' by learning about reflection, perception and perspective and unravel some of the mysteries by playing with Escher's work. The Escher collection is borrowed from the Gemeentemuseum Den Haag. The palace has been owned by the Dutch Royal Family in the past and it was Queen Emma,great grandmother of the present King Willem-Alexander, who bought it in 1896.